The iPhone comes with an alarm clock that is predictably named as the iClock. It has the basic alarm functions and works pretty well for most standard uses. 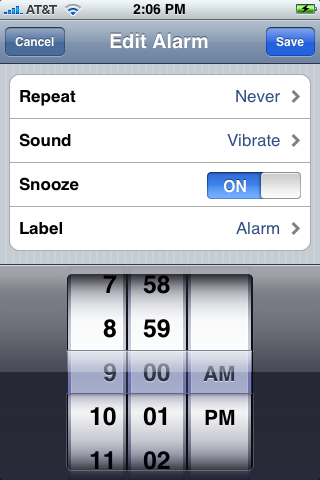 For those of you who are looking for a snazzier alarm clock that has more features, the App market is the place to be. Unfortunately, there are more alarm clock apps than any one human could possibly need and many of them are poorly built. Here’s a look at the best iPhone alarm clock apps that have good reviews and have been tested for efficacy. When you use a third party alarm app, remember to keep the alarm app in the foreground. If you forget to do this, then the app will work, but it your iPhone is in mute or vibrate mode, then the alarm ringer will not work. This is not the apps fault. Rather, it is the way the iOS has restricts the functionality of apps.